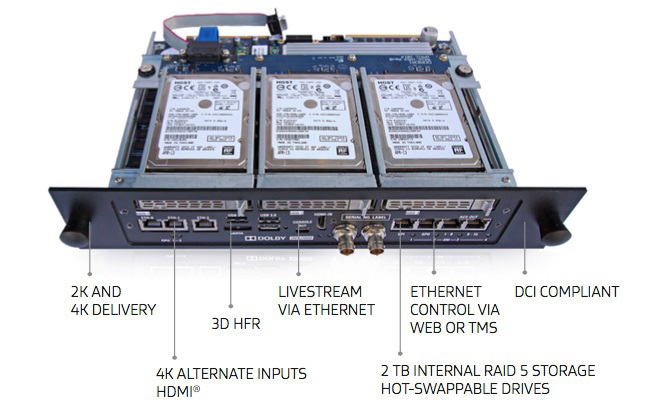 The Dolby® Integrated Media Server IMS2000 is a single-board solution that delivers faster ingest speeds, simplifying operations to save you time and money. The Dolby IMS2000 is the next-generation offering in the Dolby Integrated Media Server product line. It continues the trend of providing on-board RAID storage, server control, and a DCI-compliant media block in a compact form, enabling it to fit in a DLP® Series 2 projector. The user controls the Dolby IMS2000 with a web-based user interface, which allows access from anywhere on the theatre network.